The Happy Wanderers German Band provides the best of authentic German Music in the south central Pennsylvania area. The group was formed in order to carry on, to perpetuate the illustrious tradition of the original popular German Band Music. Comprised of only the very most crack exponents of this music, kind of like a top notch all-star group of top-notch German music players in the south central PA area, the group has performed for audiences as diverse as October fests for the Carlisle War Barracks, (Carlisle, Pa); college groups such as Harrisburg community college (HACC); Kitchen Kettle Resort Dutch Country theme park in the heart of Lancaster County, Pa; the cities of Harrisburg and Lancaster sponsored events; as well as retirement communities and corporate events. The group is made up from 4-6 men and includes Accordion/Vocals, Clarinet/Saxophone, Trumpet, Tuba, and add on of Drums and/or 2nd trumpet. 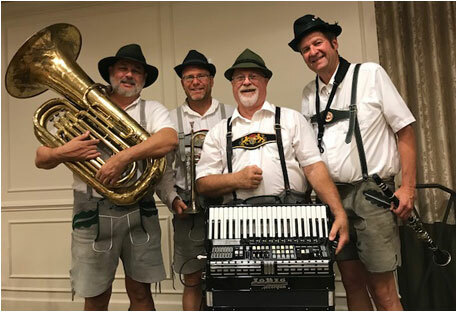 We always will appear in authentic German costume including the authentic Lederhosen, and perform the authentic arrangements of the German Repertoire including Polkas, Waltzes, and Fox Trots; all the while communicating with the audience our knowledge of and love of the music.